Can we see the Earth Twin now in the night sky from America? In what direction is it? The star that people see is it really Venus or the Earth twin? [and from another source] According to your posts, Venus has possibly stopped and reversed its orbit. If we too have stopped or have continued in our original orbit, wouldn't venus be getting less bright? It seems like it gets brighter every week, almost to the point where I can see its outline. Or whatever that point of light it, its startlingly bright in the sky. Our new ZetaTalk has been referring to the Earth Twin as the Dark Twin since the start of 2004 when the Earth stalled in its orbit, encountering Planet X in its path. Yet earlier, at the start of ZetaTalk in 1995, it was referred to almost exclusively as the Dead Twin. It is both. In early discussions, the focus was on habitability, Alternative 3 a hot topic, as this Earth Twin had been a station the Service-to-Self aliens who had engaged the US Military ahead of the Roswell crash were using as a lure. Work with us, was the promise, and we will take you there during the cataclysms, ensuring your survival. The word dark is the descriptor of choice at the present time, as visibility as it rounds the orbit and comes up Behind the Earth in their shared orbit is now the focus. Stars are visible in the night sky because of the laser of light they emit. Planets are visible because they do not absorb light rays but reflect them. Satellites or manmade metal objects such as the Space Station or probes are visible because metal is highly reflective. Comets create a spew of gas, a cloud, that reflects sunlight but are not highly visible until this cloud develops, outgassing. But what of asteroids, which regularly take mankind by surprise, appearing for a close pass but unnoticed until they arrive. Did they not twinkle, reflect light, or glow? Asteroids are almost entirely composed of hardened magma from the core of planets in the Asteroid Belt that got whacked to pieces in the past when Planet X and its entourage of moons passed through the solar system there. Magma is black, or dark gray, not a surface that reflects visible light rays. What is it about the color black that makes it dark, unseen? It absorbs light, almost entirely, reflecting little. And as a dead planet, without water, without atmosphere, without vegetation coloration, there is nothing on the Dark Twin to change this. The Dark Twin has been viewed, by astonished gazers, due to the phenomena that causes the rising and setting Sun to appear huge and orange. The size of the Sun, overhead, is a fraction of its apparent size when it rises or sets, due to the tendency of light rays in the red spectrum to bend. These light rays spread outward from the Sun but bend toward Earth due to Earths gravity, and thus arrive at Earth from this spread, giving the appearance of a larger Sun than is real. This is the same phenomena that causes the Monster Sun persona, a large dim orb next to the Sun. Why does the Dark Twin appear on the horizon, briefly, as a large yellow planet, the color and size changing back and forth to a tiny blue star? These are the colors least absorbed by the twin, thus most reflected. Yellow, being close in the color spectrum to red, bends outward and back toward Earth, thus changing the apparent size. Blue, being a straight line light ray not readily bent, reflects the true size of this object, equivalent to the Earth or Venus. I live in suburban Detroit. I saw it in the sky around 11:00 PM. It was so huge I thought it might be an airplane coming in. I see it every day slightly west NW. It is extremely bright as the Sun sets then reduces in magnitude to about the brightness of Sirius it does actually change colour (Aussie way to spell it) from yellow to blue then disappears below the horizon by about 9 PM. I saw it from about 9:30 to 10:30 my time the first night. 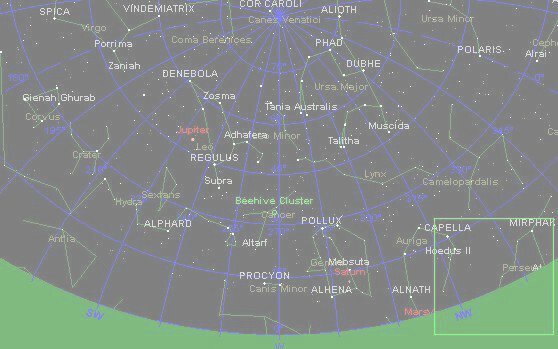 I looked at a map and did not see Mars near it or any other visible stars, it seemed alone. I went out again at 11:00 and it had just disappeared, the night was clear and the earlier time I saw it , it wasn´t low enough on the horizon to have disappeared. The next night I checked it, it was still bigger and brighter than any star etc I have noticed before. But strangely , it seemed to have moved slightly more to the West. I am in middle Indiana and I took the dog out and saw the huge yellow colored planet / star in the western sky. I didn´t stay huge yellow and low in the sky for more than maybe 10 minutes after I first spotted it. I´ve been seeing it here in Phoenix AZ over a week now. It is very obvious. It is due West in the western sky about 10:00 PM my time. Very bright, yellowish and the bigest star on the horizon.